David asked about other games with dice for actions, similar to Alien Frontiers which we played last week, so I started showing him Troyes. Gili likes the game (she entered us in a Z-Man contest on Facebook this week but we didn’t win), Ori came while we were setting up and explaining. Ori was way ahead, similar to with Ladies of Troyes, except this time it was legal. He had guys on all the red cards, including one that gives points per card, and one helped get cards, and he had the card bonus and 5 or 6 cards. He attacked everyone, making us lose most of our dice; he paid attention to attacking when we couldn’t retaliate, our group hasn’t played like that much. He had 5 in the red building at the end, plus some others. David had a harder time because it was his first play, but he used the cards he was on well. I started off with my usual white dice and the castle, but that’s not as good of an investment as placing on cards, though I did have the castle bonus. I didn’t have enough yellow dice, and got kicked off, so I couldn’t use my yellow card well. I was on 3 cards for points, and took one card. The rest of us were close in score. Gili was also using the red card where you roll dice to see how many cubes you can place on cards, as was Ori; most of the game they rolled well with most of the dice above 3. On Gili’s last roll, she used dice to be able to roll 4, and got all ones and twos so she couldn’t even place one cube. So she couldn’t finish her card, though she did get end game points for 3 cubes left on. If she hadn’t had such a bad roll she would have been in second place. Which is a win if we don’t count Ori because he plays at a different level. Ori hadn’t played, we described the game as very annoying. We restarted when David realized that points are positive. Ori did well, especially for his first play. Helped by me having no strategy; I kept leading because I was already over in most colors, he had less than two in most colors. 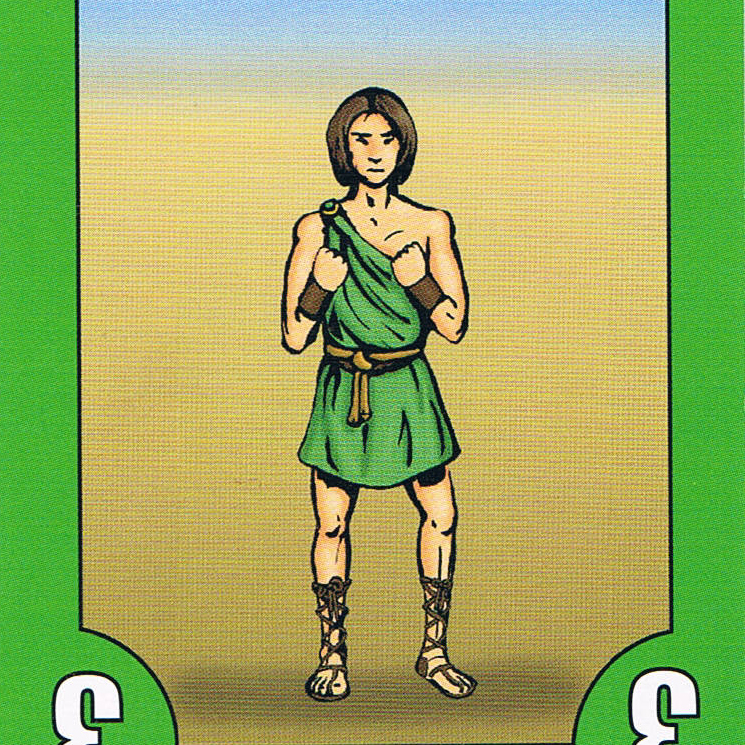 David & Goliath led to Ori describing another trick-taking game, Wizard, which interested David. We looked up a few rules and played. It’s a hard game, I kind of got it by the end, but even with having no idea it’s better than David & Goliath. You have to bid and make that exact number of tricks, based on very little information, with more cards added each round. We played to 9 instead of 15 cards because it was late; Ori would have bid differently if he had remembered that we were on the last round. I made my number of tricks on the last round which gave me points, but otherwise I was mostly losing, and wouldn’t have come in second. The round before the score was David 140, Ori 130 and me 60. I don’t have any good one-hour games, or any one-hour games, actually. They’re either short light fillers, or longer. The closest is Lo Ra, but we played last week. A new player, new to our group and to Eurogames, he’s never played any before. Our regular members keep missing due to final exams and weddings. And they changed the 7 bus line, Kate’s at the far other end, so til now one ride. A confusing game, with what feels like a lot of luck. 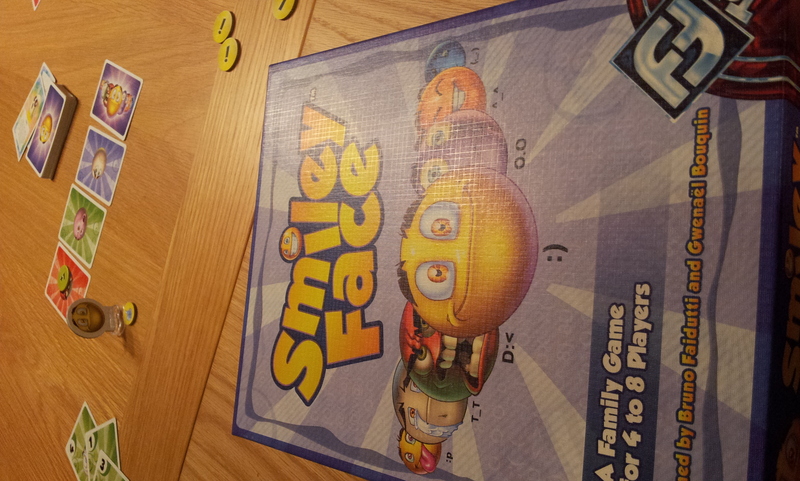 Gili selected this as a good 5-player first game for Roy, and she taught the game. We played with 4 victory conditions. Elisheva won by a lot in the 4th round, the next closest score was two victory conditions which several people had. She said she was lucky with cards, but that wouldn’t be enough. Roy started off strong, taking purple with the zero card to get a Permanent Favor. He took yellow the next time, bluffing me out of trying for it when it turned out I had more cards than he did. Eszter started with the proconsul, and had 5 faction markers by the end, one from the Senators. It was a good game and Roy liked it. Gili didn’t want to play a game with calculations, and none of the others had played this. We played without a traitor, and to 7 swords to reduce the time, though there were 11 when we finished. We lost Excalibur and some other quests, but won the Grail and Picts, and Gili beat the Black Knight. We only got two bad black cards, and had Merlins if needed. We won because of Gili’s good dice rolling for the evil side, she rolled all lower numbers except once. She kept encouraging us to play low against the D8, and it worked very well. A traitor would have won. First play for Sara. It doesn’t feel like you have much control, though there’s some. Gili has played before and doesn’t like the game because she doesn’t get it. I’m starting to get it, but still don’t know how the dragon and phoenix work – who gets it and how it scores. I would have looked it up but it didn’t matter. We played one game, and I went out first and Elisheva second, we had good cards. I decided I don’t like this game. I know it’s a good game, but I don’t enjoy all the calculations and being blocked. I said it’s too fiddly, whereupon the others asked how I can like Agricola. Gili played really well, she had 5 workers and 9 buildings, she bought the one that lets you buy 2, and she had a lot of bonus points for buildings, tracks and workers. 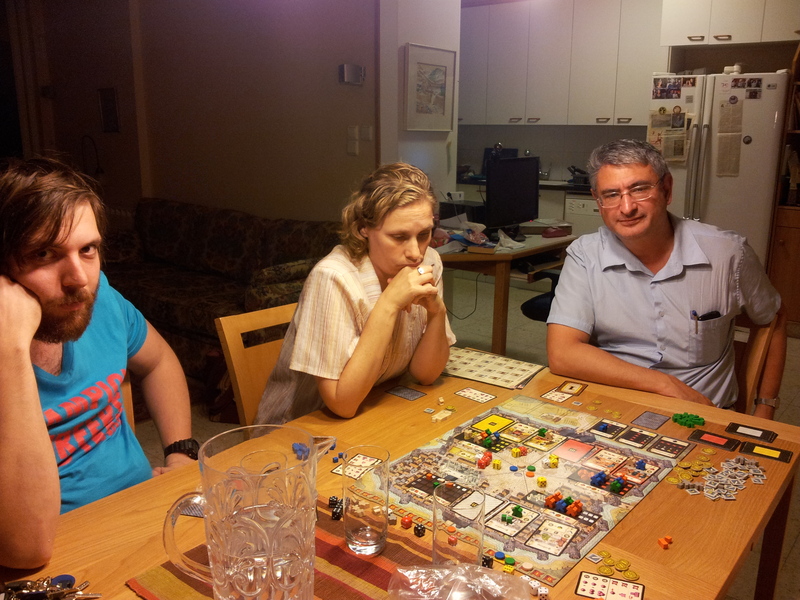 Elisheva had 7 buildings and 4 workers, I had 7 buildings and 2 workers. I didn’t have the right resources at the end, I probably would have done better by passing in the auction, the type of calculation I don’t like, with the money, resources, trading and loans. Emily taught this, and everything I asked about had been explained correctly. But towards the end of the game I noticed that they weren’t scoring number of buildings, so that makes a difference. They were able to figure it out and take the points for more than 2 buildings, but most of the game they didn’t use the option of building for points. There was a famine at the beginning and at the end. Sara got a double dragon first round, and stayed in first place in turn order for the whole game, Eitan had a single dragon. We added cards as people showed up. Once everyone understood the mechanics the game went well. As Elisheva pointed out, you can see which cards have been played and factor that in. Gili and I have played before, but a few years ago. First play for Elisheva. A tough game with all the negative decisions. 5-player is challenging, I decided I didn’t want to work hard by fighting for turn order, so I took a medicine bowl and fan lady at the start. But I didn’t think through what my first move would be from last place, I paid 3 to buy a single dragon. The events seemed to be in the easiest order possible, with taxes near the end, rice near the beginning, disease near each other, everything except war near each other, making it easier to get rid of people. On the first rice I had one for two buildings, and on the second one I decided to skip taking rice and lose 3 people, which meant I didn’t need to build as much. All the opposite of my usual strategy, as Gili noticed and questioned, but I had decided that I’d try something different. 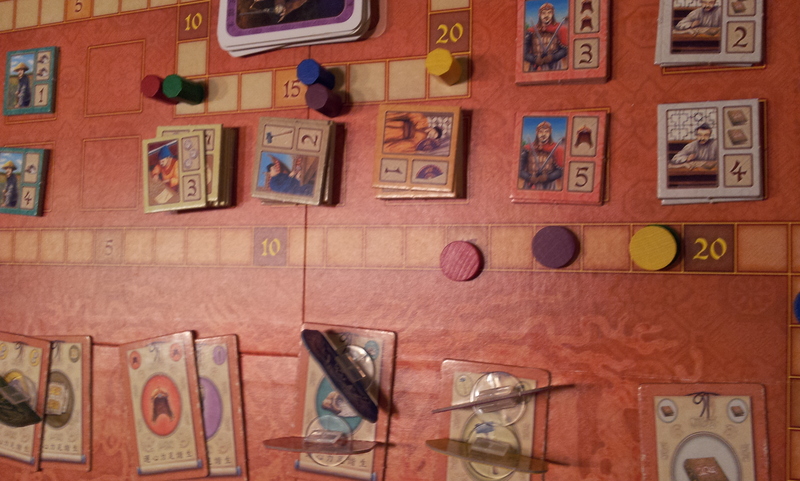 Gili was doing well with building, keeping people, and using her point tiles, and she was in first place a lot. Kate was also strong with an early double dragon, and Elisheva competed with Gili for point tiles, though she had fewer than Gili. Elisheva built well, Eszter had a hard time, she and Kate lost people to the wars. I used my jokers to buy a buddha and another fan lady. Gili told me to take the last double buddha with my joker instead of a third fan lady, she was right, I had assumed there wouldn’t be double buddhas left by my turn, though that was only a 1 point difference because there were 5 rounds left at that point. I took money instead of an action at least 5 times. Gili was ahead before the final scoring, Kate and I were even most of the time. I won because I had two double buddhas on 3 level buildings, everyone else had fewer, and we were all close in number of people. It was a good game with a lot of thinking, and we were all surprised that I won. I’m not sure you can control things much in a 5-player game. Gili wanted to try out her new game before playing with her kids. It looked light and quick, but actually has something to it, and the game, and game night, went longer than expected. It feels a bit like Fluxx, but you have more control, needing to play the right thing at the right time. Gili did a good job. 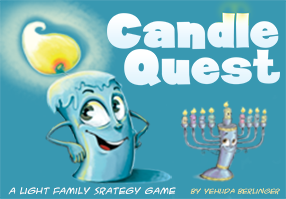 Elisheva was the first to use the Helping Hand effectively, where you can share the win. There are 7 rounds, but there’s a card that cancels the whole round, which Gili used on a round that Eszter and I won. Chana Tova, who now walks really well, did her usual playing, sleeping, grabbing and eating crackers. Gili asked Kate if she could have a cracker, and Kate gave her one from the pack. Chana Tova was on Kate’s lap, so Kate didn’t see her amazing scowly expression each time Gili took a cracker and as she ate them. But after a few crackers, Chana Tova took a cracker out of the pack, smiled, and handed it to Gili – super cute. Despite my efforts, there was a Games Day this year. Gili hosted as I wasn’t able to, and fun was had. I only showed up at 5:00 or so. First game for each of them, second game (first three-player game) for me. We had no conflicts during the game. That may have been because of the personalities of the players, or that investing in conflict takes a lot of precious resources for little reward. Though it causes the other players to have to invest a little in defense. Otherwise, the game was tighter than the two-player game, but just as good. I was pretty sure that Nadine was kicking our butts, as she got her economic engine off to a fantastic start. Toward mid and end-game however, I/we were no longer sure, as I had several discovered territories and Gili had a nice bonus buildings. We were right, as it came down to the wire. Nadine might have won if she had invested in more buildings earlier. Gili would have won if she had succeeded in her last discovery attempt (a loss of 7 or 8 vps). So, yeah, that little part of the game is somewhat annoying, but it is actually a minor part of the game. And you don’t even have to spend your time on discoveries, if you don’t want to. Nice game. Looking forward to playing it with four and five players. Nadine adds: Age of Empires III is a good basic Euro. Bill says: By the end of the session, we each had 0 victory points. We were mostly able to learn the rules, but there are still some points that need clarification. The ordeal creation portion of the game took several hours, probably because we were still learning the rules. This was bad for the hero player, because he had to be out of the room for that period. He thought he finished his character very early but actually had not, because he had not made the background. I didn’t explain this to him initially because I wasn’t there when he thought he finished and also because I was so involved in the ordeal creation and answering rules questions. Also, being a lot like Universalis, I’m not sure this is appropriate as a pickup game, since (in my experience) this type of game seems very dependent on the personality mix of the group. There was one contention for the position of Chronicler, which was successful. Since I was very inexperienced and the other players were very very inexperienced, play was a bit rocky after that, but picked up after a while. The total length of actual play was fairly short though, because most of the play time was consumed in ordeal creation. During the only clash that happened that night, I was constantly referring back to the rules for clarification because I didn’t have a full enough understanding, which took away from the overall play experience and I think gave the rules the appearance of greater complexity than there really was. The end result was that after the game, at least one player had the impression that the Blood Red Sands was more complex than D&D 4e. I don’t believe it is, but I blame my shallow understanding of the rules for that impression. To play it successfully as a pickup game, I think at least one player has to have a deep understanding of the rules and none of us did last night. Nadine says: It was a great game, very close, with each player in the lead at different times. At the start of the third scoring round we were all within a few points. In the last turn, Gili put the king in Abe’s region to keep it away from where her guys were. He scored with it 3 times – once when he took score one region, when I took score all the four regions, and at the end of the game. Cliff hadn’t played before but is a war gamer and caught on quickly, though he missed how the castillo works the first scoring round. First play for me, second for Nadine and Gili. I scored a pretty combination of cards at the start of the game: a) pay 3 to take back a share, and b) eliminate the cost of some other ability. So each round I got back a share, for free. I won when Nadine ended the game and I had lots of cash. It’s an ok game that seems somewhat unbalanced and not quite the sum of its parts. There’s not much game there. On the one hand, it’s better than Clue, with which it shares a genre. On the other, the mechanics just aren’t that interesting. Nadine adds: Hunters doesn’t feel strategic, and is too long. I shouldn’t have fought at the end but forgot that I only get a share of the money. If I hadn’t, the game would have gone on for at least half an hour, and I don’t think I could have won. I should have gotten more than I did for guessing right and having all the right things, though of course that’s at the expense of keeping shares. Jon had good cards and played well with lots of money the whole time. The loyalists won. Bill was the traitor, but he only arrived for the last two rounds of the game, and so didn’t have much chance. Nadine adds: Shadows is always a lot of fun somehow. Gili and Abe arrived at about the same time. Abe had never played David and Goliath so we played two games. Abe won the first one by a lot, Gili won the second one. Then we played Cuba with the expansion buildings. Abe bought one of them on the first round, that lets you trade 5 different non-cube things for 9 points. I had the sugar-rum-points buildings. Abe had a lot of money and cubes, he won the political influence every round except the last two. The second to last round Gili won and selected the card that lets you only produce one resource, so Abe couldn’t get the resources to use the building, so he didn’t use it all game. The market had been cleared out by political cards. He was able to ship, and still won. Final score Abe 73, me and Gili tied at 70, I had two coins. We had talked about her keeping a coin for a tie breaker during the bidding, but she wanted to select cards. We could have each done a few things differently. The game seems very well balanced because it’s usually close at the end, after my two games. It’s fun, not too long, with interesting choices that seem to matter though almost all my choices were worth 2 points. Abe beat me in number of useless cubes. Binyamin knew I had this and wanted to try it, another Secret Santa gift, from last year. We usually don’t play with real cards. It’s hard to get used to how it works, and feels hard to control. [The game was played on the] U.S. Board [using the] New [power plant] cards. A fun game with lots of planning and recalculating buys in advance. A few lucky auctions despite the 4 card preview. The new cards are different, David says less interesting because they’re more similar to each other. So to some extent fewer competitive auctions. Binyamin was trying to buy to 18 on the last round because he could fuel it, but couldn’t buy the fuel and cities.